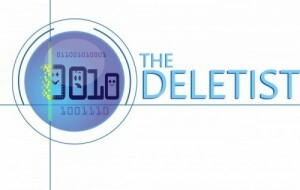 The Deletist – Page 47 – Be elite and delete. Save strategically! A couple months ago I did a massive purge in my apartment. It was interesting for me to see what types of clutter I was accumulating and where it ended up in my place. I have to confess that I was surprised at my collection of pillowcases carefully tucked away in the linen closet. Although I do get rid of things regularly as part of my never-ending quest to be a minimalist, somehow the pillowcases had been ignored for a long time. This is how I ended up with 19 of them. 8 pairs of pillowcases and three random singles. Here are some quick facts about the situation. I own 3 pillows. Two of the pillows are tempurpedic and will only fit in one pair of pillowcases. This means that I have 17 pillowcases for my one remaining normal pillow. I do realize that this is a distinctly first-world problem, but it made me think of the bigger implications of what was going on. I have random, and somewhat useless, accumulations of things that are not benefitting me. These random and somewhat useless things were escaping detection and therefore not being purged. I couldn’t adequately explain where it all came from. Doing a massive purge of the things in my apartment was cathartic, but I quickly realized how difficult this task would be to replicate with my digital items. Once stuff is digital it’s a lot easier to accumulate and it often escapes detection a lot longer. And then I just don’t care as much because the end result is not always that obvious or gratifying. When I cleaned out my apartment I could visibly see more space and less piles of clutter in the corners. This made me feel positive and productive. But to spend time performing the same type of cleanup with my digital items just doesn’t feel the same. Sure it’s nice to have everything look neat on my desktop and be easily retrievable, but that’s how most of my stuff is anyway. I guess it doesn’t feel the same because the space created isn’t visible and doesn’t matter since storage is so cheap. 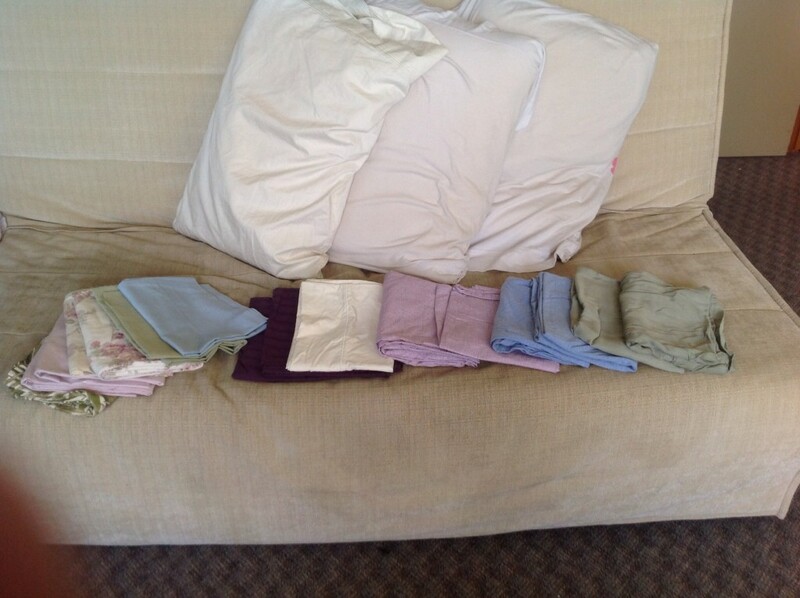 As for the pillowcases, I kept 6 pairs, 4 of which belonged with sheet sets, 1 special pair for the tempurpedic pillows, and 1 extra set because I liked it. The remaining 7 were all donated. Given my profession and personality, I’m a bit surprised at myself for having so many uncategorized posts and only 1 keyword (or tag), zombie. When I started The Deletist, I decided that the blog would be my creative space where I could write freely without judging myself. In keeping alignment with this goal, I didn’t want to create hierarchical categories before I knew what I would want to write about. I felt it might make me feel restricted in some way. Nor could I just haphazardly start creating categories without a sense of the whole vision. A proper classification scheme, in this case my hierarchical blog categories, follow certain rules. I can’t properly create a sustainable scheme without following the rules or knowing the subjects I will choose to write about. Some terms felt really obvious to me, such as Social Media, and then nesting specific social media apps underneath. But I can already see where my adhoc structure will fail me if I ever blog about Google+, which could rightfully belong underneath Google and Social Media. A further source of frustration for me was coming up with categories to describe the many posts I have about deletion, destruction, and purging. Is this really a category? It feels more like an action than a category. This is a perfect example of how keywords could be really useful, if I had more than one. They can be a terrific way to start developing defined categories by looking for common terms and naturally developing patterns. I don’t really have any excuse for not assigning keywords other than that it just escaped my radar. I think my own dilemmas highlight some common challenges people have in organizing their documents and information. It’s difficult to develop an organizational method for items without first understanding what is there or knowing what will be created in the future. And since nobody can predict the future, it becomes really challenging to create a scheme that will address everything created at that moment, but still be flexible and fluid enough to accommodate anything new. I have to confess that after I finished the draft of this blog, I decided to add a new category, “deletion”, which took care of many previously uncategorized postings. Is that cheating? I’m not sure, but I decided to be a bit more creative and less judgemental with my blog categories for the moment. At some point I’ll get bothered enough and just redo everything. My friends recently informed me that I’m a Facebook stalker. Imagine my shock since I hardly use it! When I login to Facebook I occasionally look at things such as comments, pictures, and articles, that my friends have posted. That’s what Facebook is there for, right? To share everything good, sweet, or funny that happens. However, when I go in and look, I never leave comments or “like” anything, so this, according to my friends, is what makes me a FB stalker. I’ve read a lot of articles about Twitter etiquette, but I never heard anything about FB etiquette requiring people viewing profiles to leave comments or “likes” behind. In my defense, I think if people are uncomfortable having their lives on display, they shouldn’t post it online where it’s publicly available. On FB it’s quite common for people to state their relationship status such as “single” or “in a relationship with…” on their profile page. However, when a breakup happens, people are now required to update the status in addition to dealing with the split. I recently read an article instructing people on how to update their FB relationship status without sending out a notification to friends or having it posted on a timeline. What’s the point of taking the extra steps? Isn’t FB for sharing the good, the bad, and the ugly? If somebody just went through a breakup, wouldn’t s/he want people to know to get support? If the relationship status was being changed from “single” to “in a relationship”, would people also be interested in keeping this information from being posted? It’s interesting to reflect on the message that’s subtly being conveyed. It’s fine to share things that are considered good, fun, or exciting, but when something perceived as negative happens, like a breakup, then the same rules of sharing don’t apply. One of the main reasons for using social media is to share and disseminate information to large groups of people. Yet, it often seems that we are only supposed to share things that make our lives look desirable or enviable. Most social media applications will only allow you to “like” or “favorite” something, but very few of them actually allow you to dislike something. And sometimes the interpretation can be pretty odd. People will often “like” something as a way of showing support (or maybe just to prove that they read it to avoid “FB stalker” status), but what if the “like” is for something really awkward like a funeral? I think part of the reason why I don’t engage with social media more is because I always feel horribly self-conscious about posting things publicly and leaving a trail behind. I strive to be a minimalist and this includes creating casual, random content on social media that lingers around. To me, this seems contrary to my own communication habits. As an extrovert, I’m accustomed to speaking and then thinking about what I said after, and sometimes for a very long time after if my filter wasn’t on. When posting on social media, or even on this blog, I agonize before publishing anything because I know that it’s on display and will likely be retained for a longer period than my comfort level would like. I’ve seen a big difference in my daily interactions with other humans and I can’t help but wonder if it’s because of all the electronic communication. When interacting with another human digitally, via texting, email, social media, etc., a lot of elements are missing such as facial cues, body language, tone, and inflection. It’s just not possible to replace all of these physical elements with emoticons, punctuation, and italicized, or bolded, text. So now when I communicate with people face-to-face, I notice they don’t like to make eye contact as often, the attention span is shorter and there’s a heightened sense of awkwardness about the whole affair. I also notice people hanging out together and not talking because they’re all on their devices. I have a sneaking suspicion that they’re all having a conversation through texting or IMing, even though they’re in close proximity to one another. Communicating digitally affords a person the time and space to think and reflect about what s/he wants to say before hitting the send button. It means responses can be carefully crafted to sound witty, cool, intelligent, or insert adjective here, all the time. I don’t know about anybody else, but that sounds like a lot of pressure to me. I’m a talker by nature, as exemplified by my extroverted personality. I might not always say the most appropriate things, or have the wittiest, coolest responses to everything, but my words are authentic. And it’s not recorded, for the most part, so I don’t feel self-conscious because I can say what I need to say without leaving a digital trail behind me. Highlights some of the many ways email is integrated into our daily lives. Notify all my contacts, sometimes multiple times. 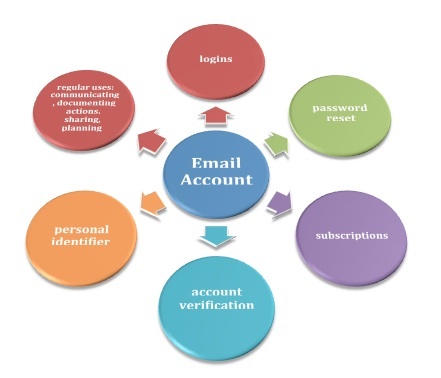 Determine which accounts use the old email address for subscriptions/newsletters, logins, contact information, and password recovery. Access each account to update the necessary information. Save important emails from old account by forwarding or downloading them. Maintain old account for undefined period of time. Inevitably I will forget to update one account or contact. Forward email from old account to new account for any new arrivals. Email usage feels so casual most of the time, that I sometimes forget how much work is involved to maintain it. Or how easy it is to connect it to so many different aspects of my life. Or how easy it is to have so many different email accounts. Including personal and professional email addresses, I have about seven separate ones, though I’m in the process of closing down two of them. I don’t mind having separate email accounts because each one serves a different purpose. I do mind not being able to check them all in one centralized location. The next phase of my email account cleanup will be researching options to have them all in one place so I can check everything at the same time. Many people view destruction as something negative and this viewpoint is not entirely unfounded. After all when we hear about destruction it’s usually accompanied by violence, a natural disaster, or something with a negative connotation. It’s the kind of action that makes people squirm and get uncomfortable. “What if we need it?” they ask as my fingers hover over the red DESTROY button. At times like these I am reminded of something my aunt told me when she worked as a librarian. Any decent library regularly weeds their collection of items (books, CDs, DVDs, etc.) to ensure that they are circulated and current. Check out this website, Awful Library Books, if you want to see what happens when libraries don’t regularly weed the collection. Staff: What if somebody comes in and asks for the book I removed? My aunt: Tell them that you’re sorry but they’re a day too late. It’s been removed from the collection. Sometimes I feel like we should adopt the same habit to regularly weed our own collections of stored information. When we can’t find something we can tell ourselves, “Sorry, but we’re too late” and move on with our lives. I do realize there’s a big difference between a library book and a document, but the basic idea is still there behind the action of purging regularly. Routinely weeding, or purging, allows us to observe another side of destruction that is often overlooked. When I destroy, or get rid of, stuff I only think about all the space I’m making for new things. In fact my approach, as The Deletist, is to focus on what I need to save so that I feel confident about destroying (or getting rid of) everything else. To destroy things artfully it’s important to learn a few tricks. Ask yourself if anybody is going to die if you get rid of something and you don’t have it later on the small chance you might need it. Save strategically. Pay attention to what you need in your professional and personal lives. Focus your energy and resources on saving and managing these things. Get rid of the rest. Establish criteria based on observations of your usage and needs. Don’t waffle on it. For example libraries weed books based on how often they get checked out. A book with poor circulation will be removed to make space for something more popular. Set aside time to go through your things (clothes, email, documents, etc.) and try out your criteria.